Is nowhere safe from sharks any more? JAWS made us afraid to go to the beaches, and since then there have been films that saw this terrifying beast of the sea come up close and personal with humans. Bill Zebub attacked our genitalia in DICKSHARK (2016), Ron Bonk has HOUSE SHARK (2017) and even Mark Polonia terrified the land with LAND SHARK (2017). Now drummer for bands such as Motograter and The Browning, Noah "Shark" Robertson brings us his terrifying tale of sharks in the shower. Yes you did read that right. This short horror comedy follows struggling musician and shark obsessed Noah as he attempts to write a screenplay for his feature film titled Shark Slayer. As he attempts to put the finishing touches to his script his normal programming which naturally involves sharks, is interrupted by an important news bulletin. Locals of his town Surf Beach are calling the authorities to report that they are being attacked in their homes, specifically their showers, by an aggressive shark small enough to get up the pipes and vicious enough to tear you a new one. Of course Noah thinks this is just rubbish news and heads to his shower, but will he make it back from the shower in one piece and finish off the script that could send him to stardom. This is a fun 10 minute short that will make you think that Troma was involved somewhere along the line. In fact if you look closely you will find Lloyd Kaufman's How To Make Your Own Damn Movie! book on Noah's bed. Really enjoyable idea that will leave you wanting to see more from the director. Its low budget and silly, what more could you ask for. 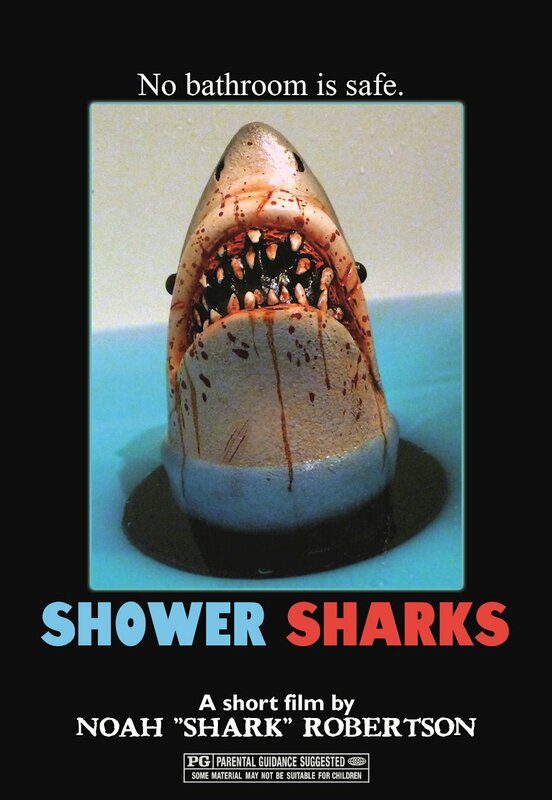 Beware the shower sharks!